Ideal for spa managers and department leads! Marketing is one of the most important business functions. Without marketing, your business will be stagnate and flatline. 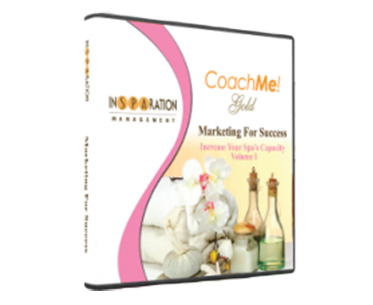 On this page, you will find the CoachMe Gold Marketing For Success series. It's divided into two volumes, each containing a one hour tele-seminar to help you drive more traffic to your spa, medi spa, and/or salon. plenty of time to implement what you'll learn on monthly basis. Marketing for Success provides a marketing map to insure your business' growth and success. Having difficulties creating your spa corporate program? Remember- the simplified you keep your program, the better off you will be. Listen to this module and learn how to develop your spa program. You will gain outsourcing information on how to set it up and price it, identify program logistics, as well as conventional program dos and don'ts. You will love the corporate presentation sample Dori provides you. All you have to do is customize it and you are ready to present and open large accounts to fulfill corporate needs and expectations. Who is in charge of your spa's/salon's marketing? If you want to increase your capacity and grow your spa and/or salon business, someone should be managing your marketing. 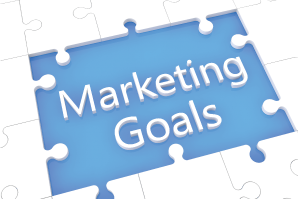 This module outlines detailed components of your marketing efforts. We will cover time management and marketing structure dos and don'ts to ensure success. Having someone manage your marketing will ensure proper planning of all marketing campaigns and will give you the ability to hold the person accountable for performance, even if that person is you. Online marketing is one of the most common advertising opportunities, yet many spas drop the ball on the content, image, and the message of the email or the website content. Online marketing is so common, but how do you know if you're doing it well enough to have great outreach? This module works through this question and incorporates web assessments, web/email copy, traffic conversion, ecommerce success, website engagement, and online community building. Implement these strategies and more to boost your online effectiveness, presence, and revenue. How do you know if your spa is reaching target consumers? Direct mail can be costly if you miss the message and the target market. Whether it be hard or soft copy, direct mail marketing is a way spa professionals can personally reach out and connect to target consumers. This module includes discussion on how to create an effective message and lead your target market to take action. You will learn about direct response marketing, developing your campaign, methods to deliver your message, direct mail ROI expectation, and post mailing management. You'll be able to create an effective direct marketing campaign that will lead new clients to your spa! Is your marketing copy not converting prospects into clients and sales? Copywriting can be very difficult- it takes a special message to get people to take action. Listen to this module and gain insiders' secrets to effective copywriting. Get the scoop on the concept of copywriting, copywriting secrets and golden rules, e-newsletter tips, menu creation, email sequences, and copywriting case studies. Afterward, you'll have a better idea of how to craft quality marketing messages and have no problem using words to paint a picture of your spa treatments and products! Is your entire team fully involved in your marketing efforts? The task of marketing can sometimes fall into one individual's hands. However, marketing isn't always an individual effort - the entire team should be involved in marketing, too. Listen to this module and obtain a better grasp on how to influence your team to participate in marketing strategies. You'll gain insight on marketing training for your team, team marketing strategies, team marketing structure, marketing scripts, spa department marketing, cross marketing, and rewards for reaching targets. Teaching your team how to market themselves and cross market will reduce your marketing cost and increase sales. Are your spa receptionists order takers? Marketing and selling to spa guests should be everyone's responsibility to increase sales. Your receptionist(s) is not only the first impression of your business, but are also the revenue generators. Receptionists have a big role! In this module, Dori runs through receptionist responsibilities, understanding marketing and sales, receptionist techniques for sales and marketing, revenue streams, and motivational bonuses. They will master the ability to increase the volume per guest by maximizing your revenue and improving the guest experience. Are your consultations paying off? Consultations are underutilized and underestimated. Consultations will improve the guest experience and generate more revenue for both treatments and retail when conducted accurately. 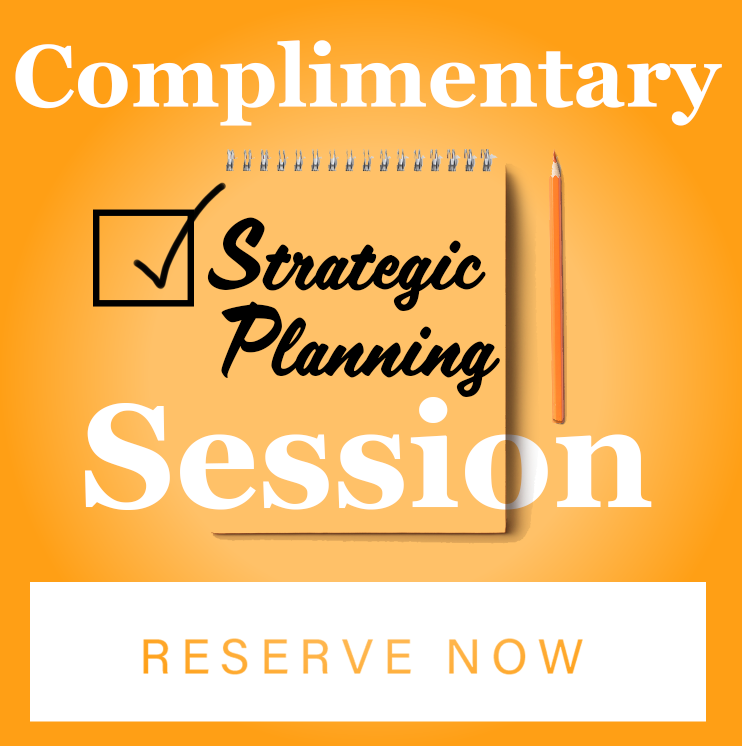 In this module, you'll learn the factors of client consultation and analysis, designating a consultant within your spa facility, location, how to implement a consultation system with structure, how to present customized programs, and pricing and closing techniques. Connecting with your client through a consultation will make you understand their needs and be able to help them more proficiently and help your business. Are your events producing leads and revenue? 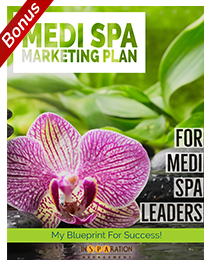 If you haven't done marketing through spa educational events, you'll want to listen to this module. Educational events give so many opportunities for spa professionals and consumers to find each other! Packed with creative ideas, Dori will cover educational programs/events you can offer, choosing topics and speakers, educational event marketing, generating leads, post event actions, and revenue potential. Implementing these strategies will make you stand-out and build personal connections with your target market and business partners alike! Are you having a hard time reconnecting with clients you’ve lost? Spas are always at risk of losing clients, but it is possible to encourage them to reconnect and rekindle their love with your services. There is a reason they left, and you need to prove to them that particular reason is no longer valid. From this module, you'll learn about why clients leave, current client frequency analysis, retention tips, lost clients reactivation campaigns, campaign theme, post campaign action, and surveys and retention. Learn the Let's Reconnect campaign and regain lost clients! How effective is your menu? If your menu seems dull, unexciting, and is not generating sales or enticing people to call and reserve treatments it's time to spice things up! Your menu should be aesthetically appealing to the eyes and mind. In this module, Dori discusses conducting a menu assessment, new menu treatments that sell, effective menu copy, menu structure, pricing analysis and recommendations, using the menu as a marketing tool, and menu dos and don'ts. Implement the menu facelift techniques and give your business a boost in sales. Are you using enough social media to promote your spa? Social media is a powerful tool and can serve as a great way to gain exposure if you use it enthusiastically, frequently, and intelligently - but you need the right exposure. This module explains exactly how to do this and reveals nine secrets to being successful involving different social media platforms, video marketing, blogging, capturing leads, generating revenue, and mistakes to avoid. Whether it is LinkedIn, Facebook, or Twitter, we'll cover it. By channeling your marketing through social interaction over the web, you'll understand your consumer and strategy like never before!